Police have arrested a teenage boy from Westtown Township in connection with a traffic violation scam. WESTTOWN TWP., Pa. (WPVI) -- Police have arrested a teenage boy they say was behind a scam involving fraudulent traffic violations in Chester County. Word of the 16-year-old's arrest came Tuesday morning, after police say the boy's father found evidence that the phony notices had been printed in his family's home in Westtown Township. The boy's father then notified police. Both the boy and his parents are said to be cooperating with the investigation. Charges are expected to be filed with the Chester County Juvenile Probation Department. The scam, first reported on Monday by the Westtown-East Goshen Regional Police Department, involved phony "Notice of Infraction" letters that were placed in mailboxes in Westtown Township earlier that day. 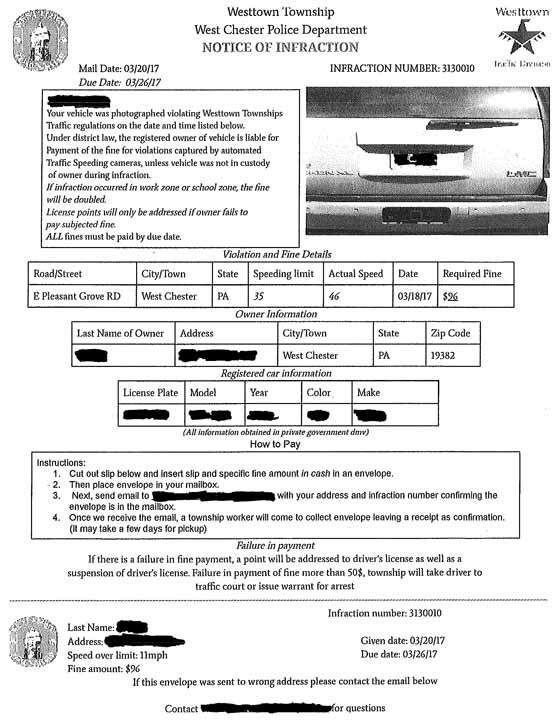 Police say residents received a one-page notice informing them that their vehicle had been captured on camera speeding on East Pleasant Grove Road. The notice said a fine of $96 had to be paid in cash by March 26, 2017. The notice included a photograph of each resident's vehicle along with the property owner's last name and complete mailing address. The notice directed individuals to leave the cash in their mailbox and send a notification e-mail to report the payment was ready for pick-up. The header of the notice included a likeness of the Westtown Township seal and the name "Westtown Township West Chester Police Department". The Westtown-East Goshen Regional Police Department assured residents it does not send speeding violations that way and does not collect cash for traffic violations.